Leadership development training is a smart, prudent investment that drives economic value and bottom line results. But if senior executives don’t care about development then—guess what—development will not be a priority in the company. That’s what Scott Blanchard, principal and EVP with The Ken Blanchard Companies, found out the hard way when his company lost a critical long-term account. An ongoing contract was terminated overnight when a new senior leader removed the entire learning and development department. In a new article for Ignite! on Making the Business Case for Developing Your People Blanchard shares how that experience drove him to explore why some organizations see and believe the tangible value of investments in training while others don’t. He also shares how it provided the impetus to build a business case that would satisfy even the most hard-nosed of executives. Blanchard discusses how the key was showing the correlation between leadership practices and employee development. He combines research that shows how strategic and operational leadership impacts organizational vitality together with some personal experience he’s had in making presentations to senior executives. In those presentations, Blanchard asks senior leaders to consider a typical employee in their organization and the key goals or critical tasks they are asked to perform as a part of their jobs. In most healthy growing organizations, people are highly accomplished at some aspects of their job, decent in others, disillusioned with a few aspects, and just getting started with the new tasks. Blanchard goes on to explain that, “If you operate with 75% of your people at a Disillusioned Learner or only a Capable, But Cautious, Performer level, you are going to have very anemic financial performance and low levels of passion and engagement. For senior leaders looking to develop their people more effectively, Blanchard has some recommendations. What’s the development level of the people in your organization? The best companies invest in their employees, supervisors, and managers. They know that people are the key to bringing plans to life and creating a sustainable advantage for your organization. Take time to develop your people. It’s one of the best investments you can make! June 11, 2012 in Case Studies, Cost of Doing Nothing, Culture, Employee Productivity, Executive Development, Leader Development, Performance Management, Productivity, Research, Situational Leadership II, Survey Results, White Papers. ← Leaders, Are You Listening for Explanations or Excuses? Enjoyed reading the article. Having worked with many different types of organisations, I’m still amazed that the ‘buy-in’ of senior leaders for any form of a leadership development programme in many instances is based on their own experience, as you’ve alluded to at the beginning of your article. If they haven’t rated the value they got from development in the past, then sadly the chances are that they’re not going to put much store (or allocate budget) to it in the present or future! I completely agree that an evidence-based business case should actually be a no-brainer, but it should be recognised that other ‘non-tangible’ variables can sometimes be the thing that tips the balance. Really interesting article. 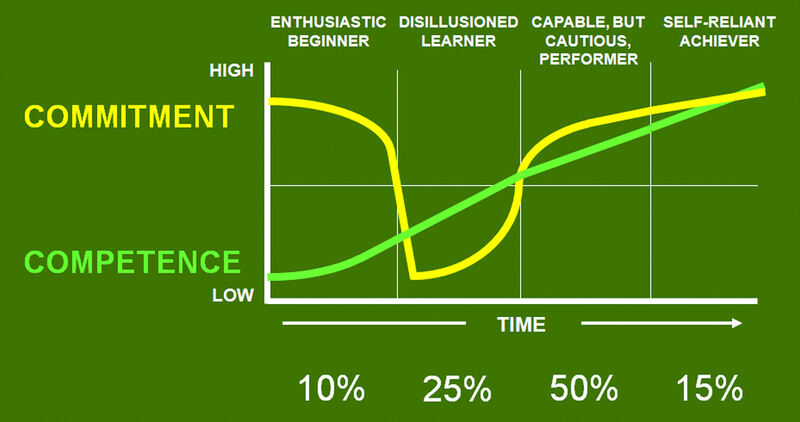 The idea of preparing a bright, new, enthusiastic employee for a time when they will become a Disillusioned Learner is one I like although, in practise, I would imagine the way in which this is done is as crucial as the act itself. Great article – I think you’re preaching to the converted… The mystery to me is your point plus the continued lack of follow up when we send leaders to LD programs. They return and the whole experience is left behind them… Rich area for discussion, further thought, research, and hopefully — action to change this the near future! I agree fully with this analysis. at my company i rolled out a $1.2 mil net projected program and after the first quarter based on performance the projections jumped 30%. the second and third quarter we saw that staff became disillusioned about what , why, how they were doing their functions. We are struggling to get out of this cautious stage and as such our projections have returned to initial budgets. this however showed that there is room for improvements and growth but we need to extend the enthusiasm and move quickly to the self reliance stage. Nice article on leadership development David. SPM Learning, an award winning leadership development organization, has also identified that in today’s new economy a holistic talent management strategy is critical to develop tomorrow’s leaders (http://tiny.cc/7sqkgw).